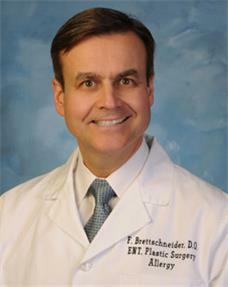 Dr. Brettschneider is triple board certified in Otorhinolaryngology (ENT), Oro-Facial Plastic Surgery and Allergy. He received his degree from Michigan Sate University and was a Nuclear Pharmacist prior to starting his medical training. After completing his residency at MSU/McLaren-Macomb he opened his ... Read More practice in Port Huron in 1990. As a board certified Otorhinolaryngologist (Ear, Nose and Throat), Dr. Brettschneider is trained in advanced sinus surgery performing office based balloon sinuplasty, Functional Endoscopic Sinus Surgery, and skull based surgery (minimally invasive). He is also skilled in facial plastic and reconstructive surgery. Skin cancer removal and reconstruction, Rhinoplasty, Face Lift, Eyelid Surgery, and Otoplasty are some of the plastic surgery procedures performed. Dr. Brettschneider stays up to date on the latest surgical procedures through his membership in the American Academy of Otolaryngology-Head Neck Surgery, American Osteopathic Colleges of Otolaryngology an Ophthalmology, and the Michigan Otolaryngologic Society. Dr. Brettschneider has lectured on multiple occasions on Endoscopic Balloon Dacrocystorhinostomy, Coblation Tonsillectomy, Thyroid Tumor Management, and Sleep Apnea surgical treatment.